One of the highlights of the Vienna Festwochen this year was Rabih Mroué’s The Pixelated Revolution, a highly engaging lecture/performance that focuses on how—and with what effects—mobile phones have been employed to document the Syrian revolution. 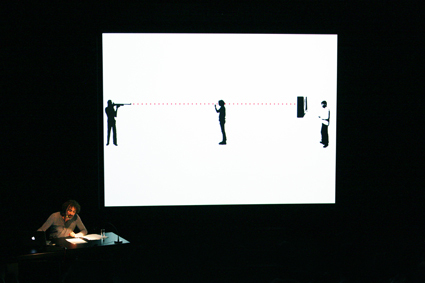 The production (which was also displayed in a condensed form as an installation at Vienna’s Academy of the Arts) is a one-man show produced and performed by Mroué himself: a Lebanese artist, playwright and performer whose recent video/performance work explores themes pertaining to politics, violence and war. The theme of the Festwochen this year was “Unrest of Form: Imagining the Political Subject.” The Pixelated Revolution reflects on the role that citizens and activists have played in capturing and distributing footage that unsettles the ‘reality’ of the conflict generated by governnment-sanctioned media sources in Syria. The lecture itself, however, is meandering and inquisitive rather than politically dogmatic in its structure. 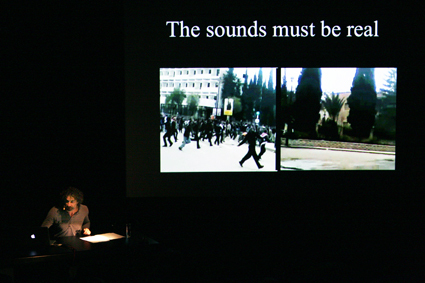 As the subtitle of the production, “A Non-Academic Lecture,” suggests, Mroué’s interest lies in stimulating thinking rather than pedagogically instructing the audience in how to read or understand the conflict at hand. Seated at a table in front of a large screen, Mroué begins the lecture with the following statement: “The Syrian protestors are recording their own deaths.” This observation, we learn, is based on the large body of mobile phone footage that he downloaded from Facebook, samples of which (including footage of protests, soldiers, tanks and running feet) are projected behind him onscreen. When viewed together, Mroué argues that this digital archive constitutes a proclamation akin to the Dogme95 manifesto initiated by Danish filmmaker Lars von Trier which challenged filmmakers (through the imposition of a series of restrictions and constraints) to generate a realist aesthetic driven by protest. Mimicking the “Vow of Chastity” coined by the Dogme95 group, Mroué lists a series of rules to be followed by those seeking to capture the reality of the Syrian conflict and to protect themselves and others from retribution: Shoot from behind and don’t show faces, but film faces when someone is being assaulted; don’t use tripods, don’t drop your phone and, above all, don’t credit the director.